The Atlanta Fly Fishing Club speaker for the March 13, 2013 meeting was Eric Stroup. 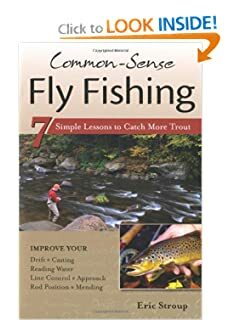 Eric presented themes from his book Common Sense Fly Fishing. Topics include positioning, casting, drift and line control. The Atlanta Fly Fishing Club Mentoring Program was started by JD Forrester, a long time member of the club with the purpose of introducing new members to veteran members while also providing fly fishing expertise on local rivers like the Chattahoochee River. Our club is all about education and camaraderie and each of these new members are paired with a mentor that they can reach out to for advice in the future. Members of the Atlanta Fly Fishing Club got together March 2nd at Paces Mill along the Chattahoochee River for a mentoring day. Even though the weather was cold and cloudy with snow flurries we had an excellent turn out for our Mentor Day on the Hooch. Thanks to JD Forrester for organizing a great day. “We were greeted with cold temps and spitting snow, but that did not keep the intrepid AFFC mentors and mentees from meeting. I think the session was a success with many things being learned and even some fish were caught. Jim and Linda Harrington in perfect camouflage gear. Who is the guy in the white hat? Steven Miller watching Eric Davies. Jimbo Jim McKean rigging up as Tyson “Muley” Reed looks on. Uncle Miltie Sams (mentor?) being taught spey casting by Ken Louko. Ed Chamberlain working on casting with Holly Shikano, and Linda and Jim Harrington. Club members got together in February for a fly tying workshop at Fly Box Outfitters. Bret Nelson did a great job teaching a few flies. Willie was recovering well. Good time had by all. Contact Bob at email for more information. September is prime dry fly time on the Frying Pan River but the fishing is great year around. For those of you who could not come to the last meeting to see Cameron Cipponeri‘s presentation, below will give you a basic idea of cost as well as a link to the presentation. Air fare to Denver is about $200 and depending on the number going will dictate rental car/van cost. The Taylor Creek Cabins have a mile of private water with another mile of public water that is seldom fished. I have fished the “Pan” for twelve years, September is dry fly time. The average fish is 16″ but much larger Trout lurk through the river. You can get up early and the two miles of river at Taylor Creek Cabins is yours to fish free then do your guide trip the remainder of the day. I was very pleasantly surprised at the turn out for the AFFC club trip from Jones Bridge to Holcomb Bridge this Saturday. I wish the fishing had been as good as the participation. The club generally has a local club trip the weekend following club meetings. The purpose of these trips are to help introduce new members to other club members. Eric, Dwight, Mark, Ed, Korey, and Greg waded. From what I heard the best catching from a wader was around 5 and it went down to 2 or 3. Pretty tough fishing. But we did have some significant events. Eric did really well after his hip replacement-a bit sore, but hung in there and the future is bright. And speaking of a bright fly fishing future, Korey got his first trout on a fly rod-way to go Korey! Phil, Ron, Milton, Mike, Steve, and JD floated and the catching was not much better. The most we got was around 10 and it went down to 5 or 6. Again tough fishing. But I think everybody had a great time and it was good to be out on the water. Join us next time for an AFFC trip. This pictures are from a trip to South Andros in the Bahamas last week with Louis Cahill and Kent Klewein. http://www.ginkandgasoline.com/ I met Louis at the Atlanta Fly fishing club meeting last summer and shortly after signed up for the trip. I am so happy that I did. Despite some wind the fishing was great but what made the trip one of the best I have ever had was the information that I received. Each evening they walked us in detail through topics like advanced casting techniques, bonefishing 101, tying bonefish flies and photography. The South Andros Lodge had great guides and was hosted by a friendly and helpful staff.